Learn more about Area Rentals, Inc. serving New Jersey with quality construction equipment rentals since 1993. Area Rentals, Inc. has been serving the New Jersey and New York construction industry with top quality equipment rentals since 1993. We are a family-operated small business with over 35 years of combined rental experience, striving to provide optimal customer service to commercial and industrial trades. 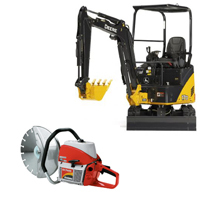 Area Rentals has all the equipment you would find at the national chains PLUS hard to find specialty equipment like grout pumps, floor prep equipment, battery operated & electrical equipment for indoor projects.